Today I’m pleased to welcome Kimberly Rose Johnson to A Bed of Roses…Thorns Included. Kimberly Rose Johnson holds a degree in Behavioral Science from Northwest University. She lives in the Pacific Northwest with her husband, two teenage sons, and their yellow lab. 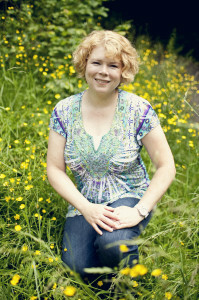 She writes sweet Christian romance for Heartsong Presents and is a member of American Christian Fiction Writers. She enjoys taking long walks with her husband and dog, reading, dark chocolate and time with friends. The small-town CPA can’t forget how Blake Mitchell jilted her and left their hometown without an explanation. 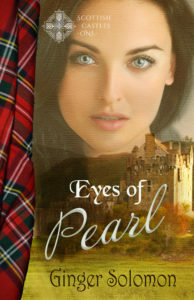 But when her first love returns to Leavenworth, the ruggedly handsome writer evokes conflicting emotions, especially when Susan meets the child she assumes is his daughter. Since his parents’ deaths six years ago, Blake’s been raising his little sister on his own. But he’s never forgotten the woman he left behind. 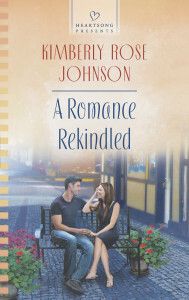 Now, he can’t undo the past, but maybe he can change the future…if he can convince Susan to give him one more chance. My review: This is a wonderful tale of forgiveness and persistence. Blake thought he was doing what was best when he left Susan behind, but he never considered the situation from her perspective. Then he returns to Leavenworth to apologize and finds out how angry she’s become. I loved how patient he was, with both his sister and Susan. He struggled, but remained persistent in gaining her forgiveness. In the middle of writing A Romance Rekindled my husband and I took another trip to visit Leavenworth. He has extended family in town and we enjoy visiting with them while we are there. We hung out with his great Uncle Bob one afternoon and I mentioned wanting to go hiking at a certain trail because, Blake, the hero in A Romance Rekindled, hikes there. I like to get a good feel of the places I write about. We never made it to the trailhead that day, but got up early the following morning (Sunday) to go for a hike before church. Imagine my surprise when Uncle Bob came up to us after church and said to my husband and me, “I heard you went hiking at . . .” The name of the trail escapes me, but it’s in the book. 🙂 That inspired a new twist on that story. Poor Susan, the heroine, couldn’t do anything without half the town knowing—isn’t that how small towns are? At least that was my experience. I asked how he knew we’d gone hiking, then went on to explain that although we went to the trailhead we never actually went hiking. I was unprepared for that kind of hike. To be honest, I was quite intimidated by the fact that we were supposed to leave our name, along with the time and date we were hiking in a box at the trailhead. That trail was way above my novice status, nor was I prepared to come face to face with a bear—something, I have in common with my character, Katie, Blake’s little sister. That morning I learned one is never truly alone when in a small town because someone is always watching out for you. I imagine that is exactly what it is like with the Lord. He is always watching. Always there. Do you live in a small town? Have you ever had a similar experience to mine? I’d love to hear about it. Thank you, Kimberly. I’ve never lived in that small of a town, but I think it would be nice to be in a place where everyone cared if you lived or died, besides your family. Blessings, and don’t forget to answer Kimberly’s question above. Thanks for hosting me, Ginger. I’ve never lived in a town that small either. With all the tourists pouring into Leavenworth on the weekends one wouldn’t think it’d still have that small town feel, but it does. It was my pleasure, Kimberly. Congratulations on your new release.